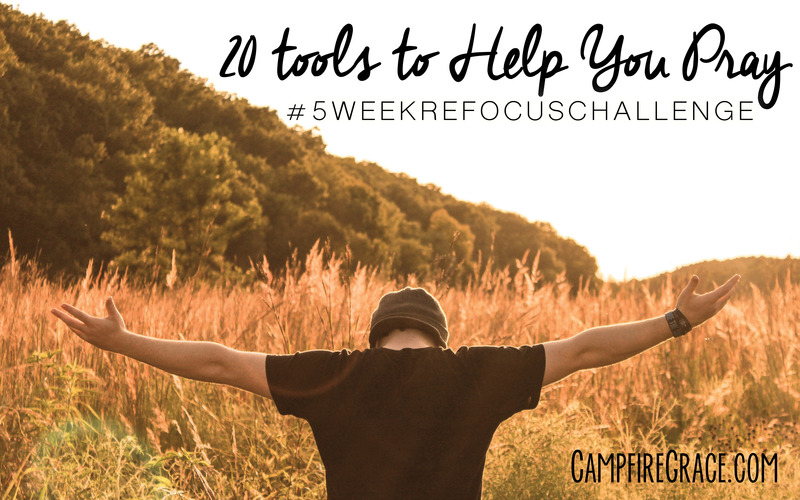 Welcome to the 5 Week Refocus Challenge. I have set up this challenge to find my way back to the best God has for my life. Instead of being swept away by the tides of busy schedule, bursting closets, and an overstimulated mind, my prerogative is to return to closeness with Jesus, to refocus my worship on Him. One way to do that is by rekindling my prayer life. In the last post, I mentioned 5 reasons we can’t stay focused in prayer. I will address the 5th issue here today: no one has taught us how to pray. Practice: Don’t be discouraged if your prayer life feels weak. Your prayer muscles wont become strong without regular exercise and practice. Let Scripture Inspire You: When we read God’s heart in His Word, we can connect with Him more intimately as we pray His desires. Pray spontaneously: This is where most of us gravitate. We pray what we feel, in the moment, for the moment. This can be beautiful, authentic, and raw. Use a Prayer Blueprint: This is the opposite of a spontaneous prayer. We naturally pray for ourselves, our needs, etc. A “blueprint” reminds us to pray in repentance, pray for the global church, and focus on praise and thanksgiving. Find pre-written prayers in Psalms, church resources (Book of Common Prayer, etc. ), and even Pinterest! Pray through A.C.T.S. : This is a simple blueprint that reminds us to focus on Adoration of God, Confession of our sins, Thanksgiving for His gifts, and Supplication for our needs and the needs of those around us. Pray ACTS specifically: Spend Monday meditating on God’s amazing character. Adore Him for an entire day. Spend Tuesday with an open heart to conviction; repent as the Holy spirit makes you aware of your selfishness. Take all day Wednesday to thank God for His gifts! These 3 days will sharpen your perspective of God, boosting your confidence for Thursday, the day you spend praying for others (supplication). Get a prayer app: I appreciate Echo for helping me keep track of names and needs I commit to pray for. It also has a timer so I can focus on prayer with out distractions! Let others See You Pray: Jesus prayed intimately and personally with the Father in front of the disciples. My parents did the same each night they tucked me into bed. We can do the same in front of our children, siblings, roommates, spouses, and parents. If we do so to honor God, not ourselves, we can provide others with a powerful example of how to pray. Prayer Walking: Get active and pray outside the box! Walk downtown, in your neighborhood, on a college campus, or at the mall. Allow buildings, people, and billboards to shape the focus of your prayers. Drive-by Prayers: Same as prayer walking, just pray as you drive. I’ve started praying for the joggers I see on my way to church on Sunday morning. Pray Proactively: We tend to allow negative events and fear shape our prayer life. What if we prayed ahead of time for health, connected marriages, salvations, and closer walks with Jesus. Screen-time Power: Our phones can be dramatic distractions in our lives. Find ways to replace social media scrolling, games, constant texting, and google searches with moments of intimate prayer. You can also incorporate prayer into your screen time, seeing Instagram through God’s eyes, praying for your Facebook friends, etc. Target Supplication: Pray for a different sphere of influence each day of the week: family, work, local church, government, persecuted church, spouse, friends, etc. Prayer Support: Paul asked for prayers that he might be bold to share the gospel. Who do you know is sharing the gospel that you can pray for their boldness? Pray On the Spot: Ask people how you can pray for them, then ask if you can pray with them, right there and then. Invent a Prayer Trigger: Every time I ________, I will spend a moment in focused, intimate prayer. The meal prayer is a perfect example, but it often gets overshadowed by hunger and busyness. Invent a new prayer trigger like getting in the car, brewing coffee, saying goodbye, tucking my kids in, etc. Bonus: make your prayer trigger a community event with your spouse, family, classmates, etc. Clean and Repent: While scrubbing the floors, I confess my sin. As I weed the garden, I pray for God to rip the roots of pride out of my life. Prayer Massage: give your friend, sibling, or spouse a back rub or foot massage as you pray for their physical health, spiritual intimacy with God, and boldness to share the gospel in their lives. Praise through the ABC’s: use the alphabet to help you think of various things to thank God for in your life: Legs that walk, my Mom’s presence, the Neighbors kindness, for Opening my heart to your gospel, for Perseverance through a trial, etc. Monday, Aug. 24: Take a moment to be still tonight, and connect with God, intimately, for 10 minutes. Tuesday, Aug 25: Practice praying simple prayers of adoration today: tell God how great He is, just because He is God. Pray Psalm 145 as a reference. Wednesday, Aug 26: Offer a prayer of confession. Open up your heart to the Holy Spirit’s conviction, and acknowledge with God the areas in your life you have dishonored him. Feeling stuck? Pray through Psalms 32. Thursday, Aug 27: Set your heart on thanksgiving! Throughout the day, train your thoughts to say “Thank you” to God for each moment, person, blessing, or trial you encounter. Then check back for Rekindling Prayer Part 2: How to pray. Friday: August 28: Spend time praying for the needs of those around you. Focus on God’s heart for them: to enter into relationship with Him through Jesus, to grow in faith, to share the gospel, etc. Saturday Aug 29: Pick a “prayer tool” above and practice it with a friend or family member. Sunday, Aug 30: Pick a prayer tool you can incorporate into your daily schedule for the next 6 months. Mine is the focused ACTS prayers. 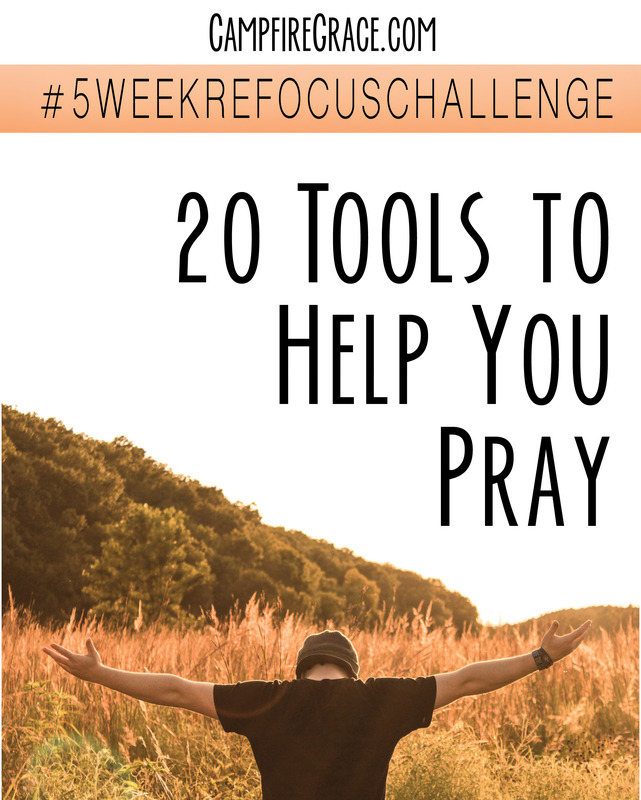 What is your favorite prayer tool to keep you focused?